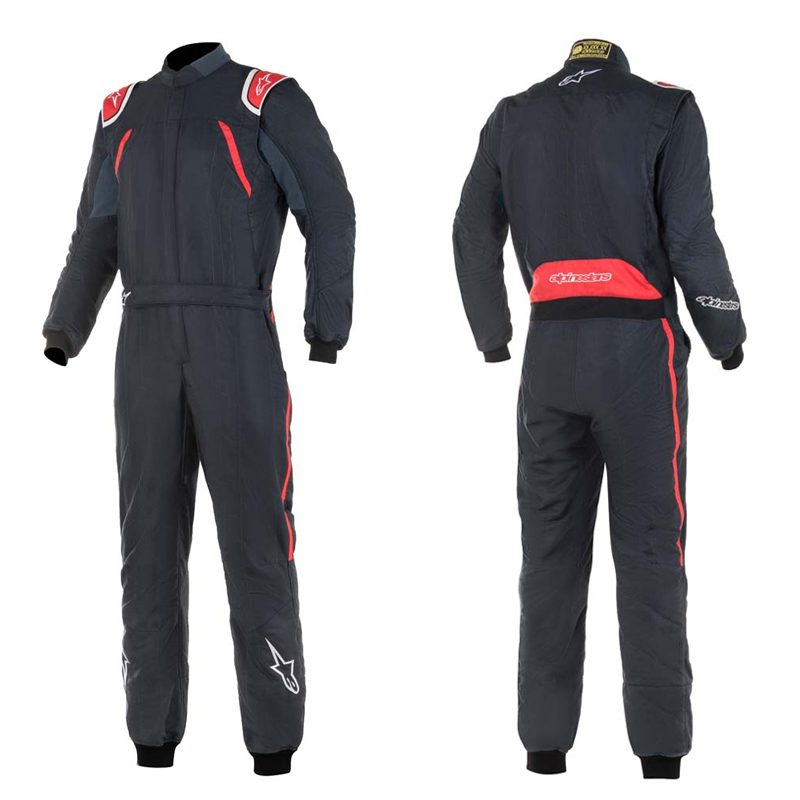 The company Alpinestars - one of the major global manufacturers of protective clothing for racers, has introduced a new collection of equipment for motorsport and karting in 2019. For more than 50 years, the company has actively collaborated with racing teams and the world's best pilots participating in such championships as Formula 1, Formula E, WEC, NASCAR, WRC, Dakar Rally Marathon, and provide exceptional opportunities for Alpinestars technical staff in "combat" conditions, which allows us to bring its consumer properties to the best performance, both on the track and outside it. Daily research and development of new high-tech materials, providing less fabric weight, improved air permeability and comfort, give pilots using Alpinestars equipment an advantage on the track. The new top model of Alpinestars Hypertech overalls for motor racing is an excellent demonstration of this approach of the company to high-tech developments. The overalls use new materials and constructive solutions, which makes it the easiest model from the entire new collection, as well as the most convenient, while meeting all the requirements of the FIA. Physical and psychological stress in stressful conditions reduces the pilot's reaction speed, while the Hypertech model is designed for maximum comfort during a race, allowing the pilot to maintain good coordination of movements and increase his endurance. Among other innovations from the collection of 2019, we note, almost completely updated line of overalls for motor sports. In addition to the above-mentioned top model Hypertech, this is a model from the premium segment GP Tech v2, a model GP Pro Comp, a new jumpsuit of budget class Stratos, as well as a new product from the Stella line, specially designed for female pilots. The updated line of homologated overalls for entry-level kart KMX-9 v2 is presented in a wide palette of colors from which everyone can find the right one. 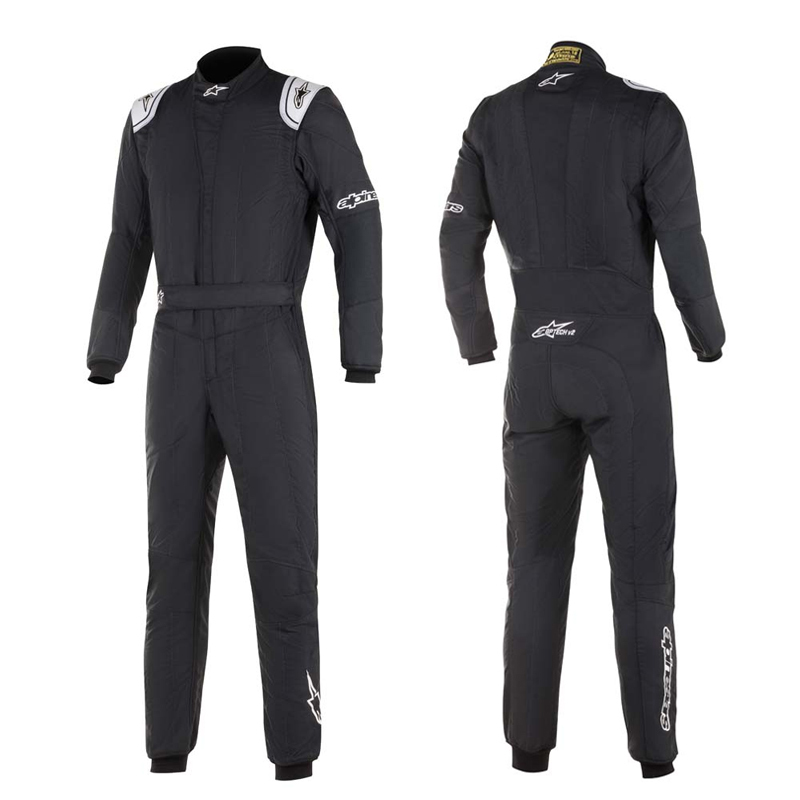 For undemanding or novice kart drivers, the KART Indoor jumpsuit, which has no CIK homologation, but with the best price-performance ratio, is an excellent choice. Relying on the widest audience, from Formula 1 riders to young kart racers, Alpinestars tried to focus on every detail when developing a new equipment collection, once again, wanting to justify a high level of trust in its brand in the world of motor sport. • Certified to FIA 8856-2000 homologation standard. • Nomex® anti-static outer shell fabric offers exceptional heat and flame-resistant proprieties. 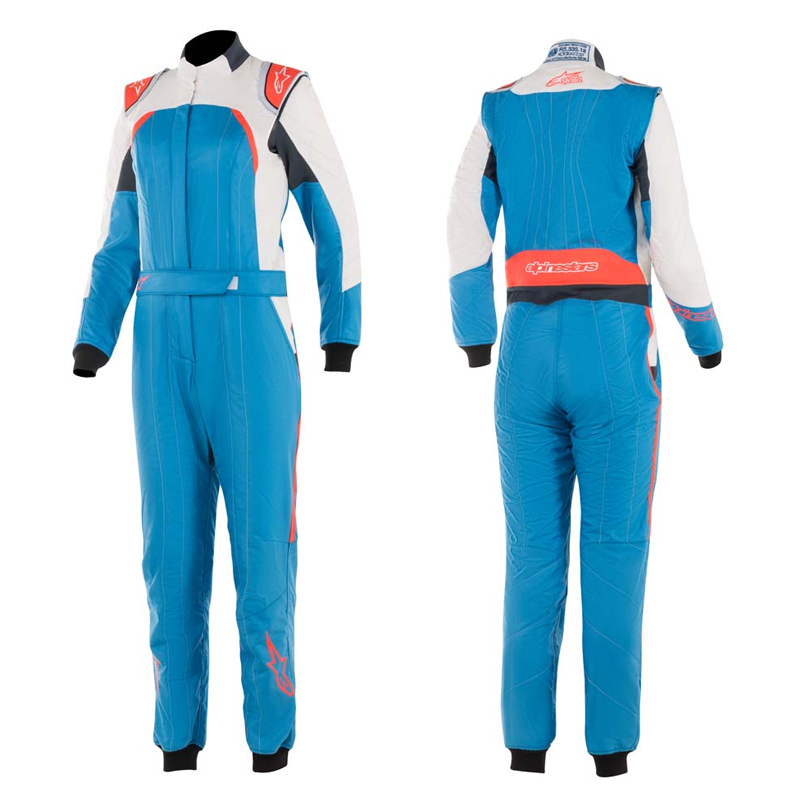 • Super-lightweight at 210g/sqm and breathable two-layer suit incorporating thin stretchable panels for maximum comfort and effective regulation of body temperature. • Innovative and soft lining knitted fleece material technology offers breathability and comfort. • Formula 1-derived stretch panels are strategically placed at the lower back and sides, elbow, crotch and knee zones, to provide excellent flexibility, both in and out of the car. 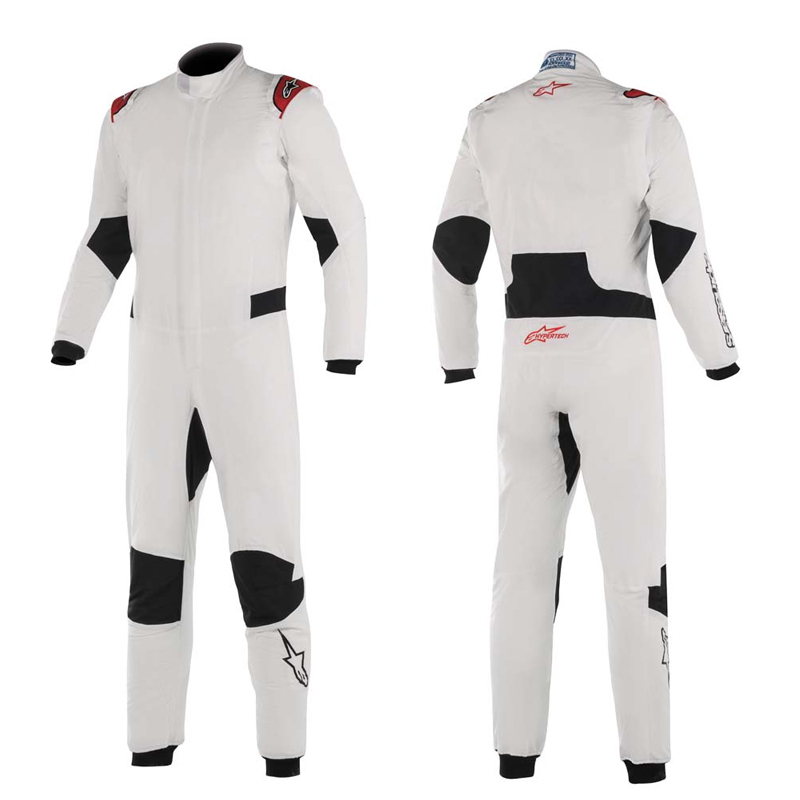 • Alpinestars fully floating arm construction with stretchable knit fabric ensures minimal material resistance while driving and allows for easy entry and exit into and out of the cockpit – important for ensuring comfort. • Reduced material volume in chest area to ensure maximum weight reduction and less material bunching under belts. • Soft and thin wrist and ankle cuffs for maximum comfort and reduced weight. • Flat seam construction to reduce pressure points and improve strength. • Alpinestars exclusive shoulder epaulette construction provides an effective feature for the extraction of the driver in the event of a crash. 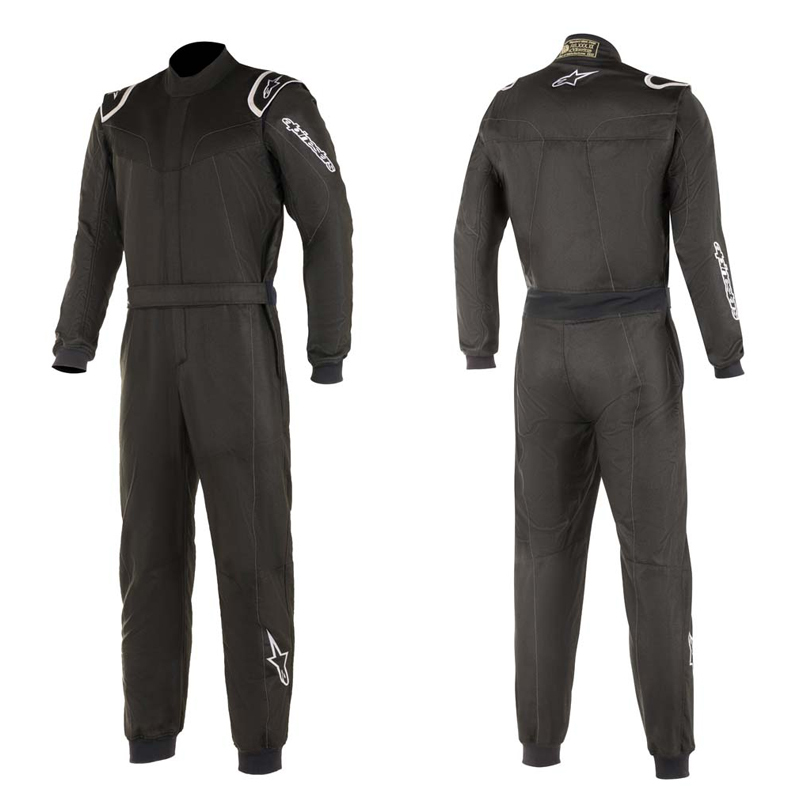 • Nomex® anti-static outer shell fabric for exceptional heat and flame-resistant proprieties. 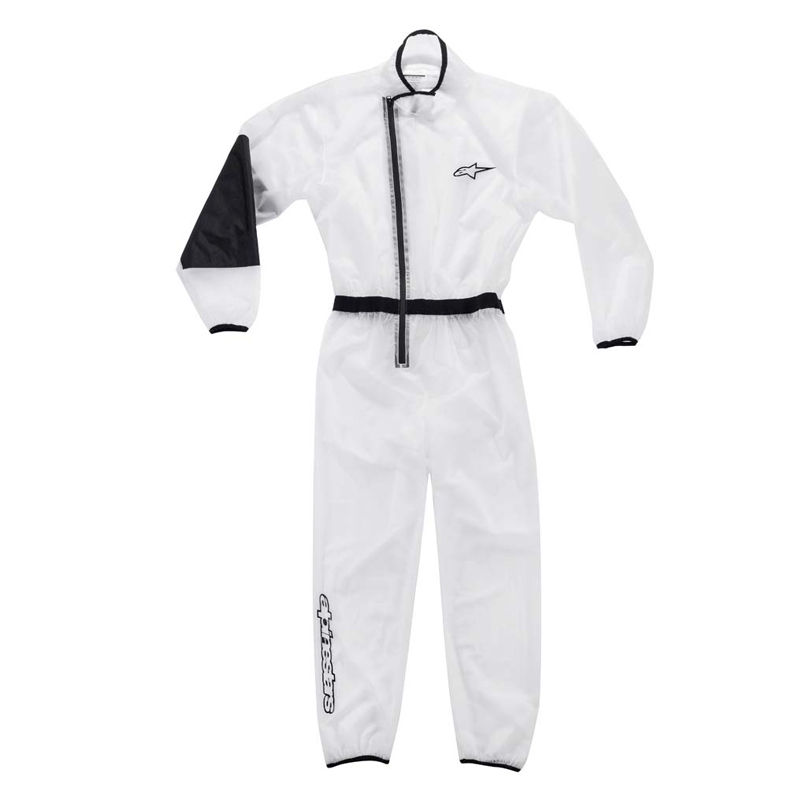 • Lightweight and breathable multi-layer suit incorporating thin stretchable panels for maximum comfort and effective regulation of body temperature. • Updated outer shell uses lighter weight material. • Formula 1 derived stretch panels are strategically placed at the center of the spine, lower back, elbow, crotch and knee zones to provide great flexibility, both in and out of the car, and aid entry and exit from the cockpit. • Alpinestars fully floating arm construction with stretchable knit fabric ensures minimal material resistance while driving. • Alpinestars exclusive shoulder epaulette construction providing easy extraction system. 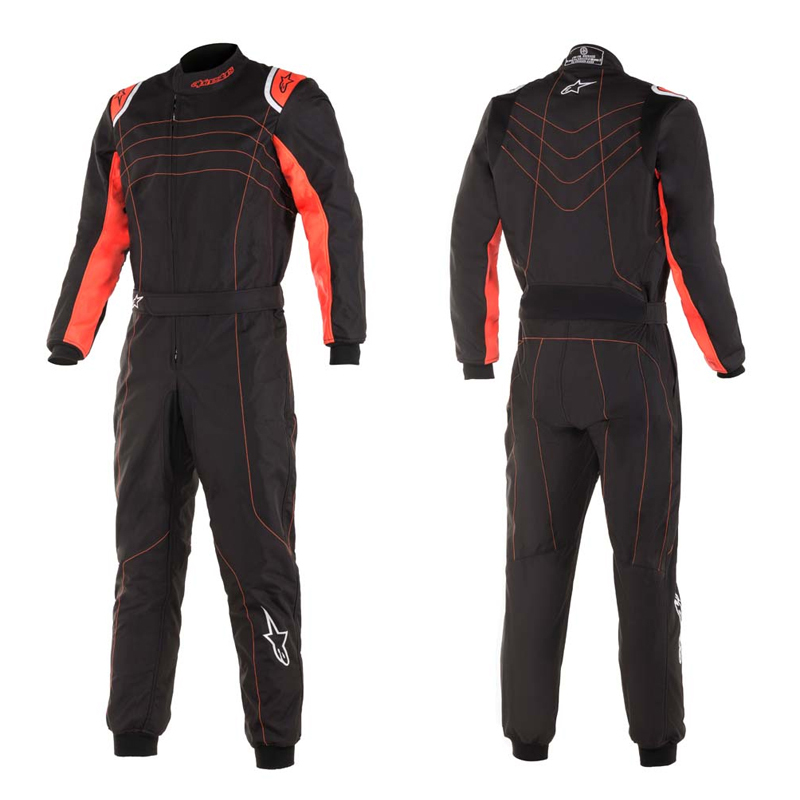 Certified to FIA and SFI homologation standards, the GP Pro Comp suit has a three-layer construction offering ultimate protection and lightweight construction, while the breathable lining aids driver comfort. Pre-curved arms and legs and stretch panels on the crotch, waist and underarm offer optimum levels of movement and comfort, while the cuffs on the arms keep everything in place and prevent the material from bunching up. Other thoughtful details include a soft, ribbed knit collar and flat seams on the shoulders. • Certified to FIA 8856-2000 homologation standard and SFI (SFI:3.2A/5) standard. • Three-layer, lightweight suit incorporating knitted stretchable panels for maximum comfort and excellent breathability. • Alpinestars shoulder epaulette construction facilitates the effective extraction of the driver in the event of a crash. • Ribbed, stretchable wrist cuffs. • Bootcut leg construction for comfort while driving. Certified to FIA and SFI homologation standards, the Stella GP Pro Comp has been designed specifically for the female form. It boasts a three—layer construction for protection and lightness, while the breathable lining aids driver comfort. Pre-curved arms and legs and stretch panels on the crotch, waist and underarm offer optimum levels of movement and comfort, while the cuffs on the arms keep everything in place and prevent the material from bunching up. Other details include a soft, ribbed knit collar and flat seams on the shoulders. • Alpinestars shoulder epaulette construction to facilitate the effective extraction of a driver in event of a crash. 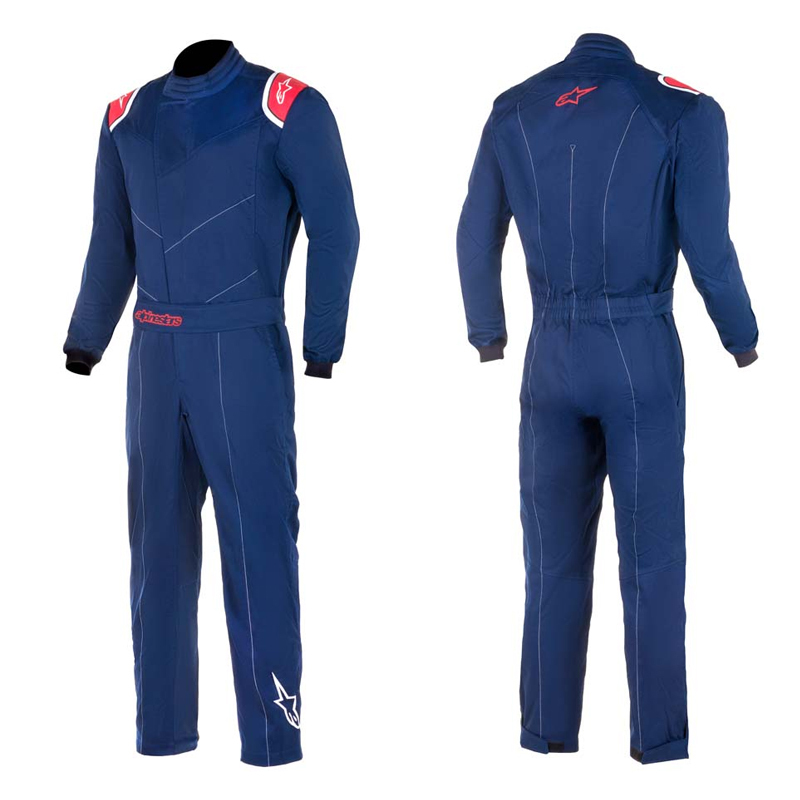 A comfortable, relaxed-fitting performance racing suit which incorporates excellent safety features and technically innovative materials, the Stratos suit is certified to SFI homologation standards. 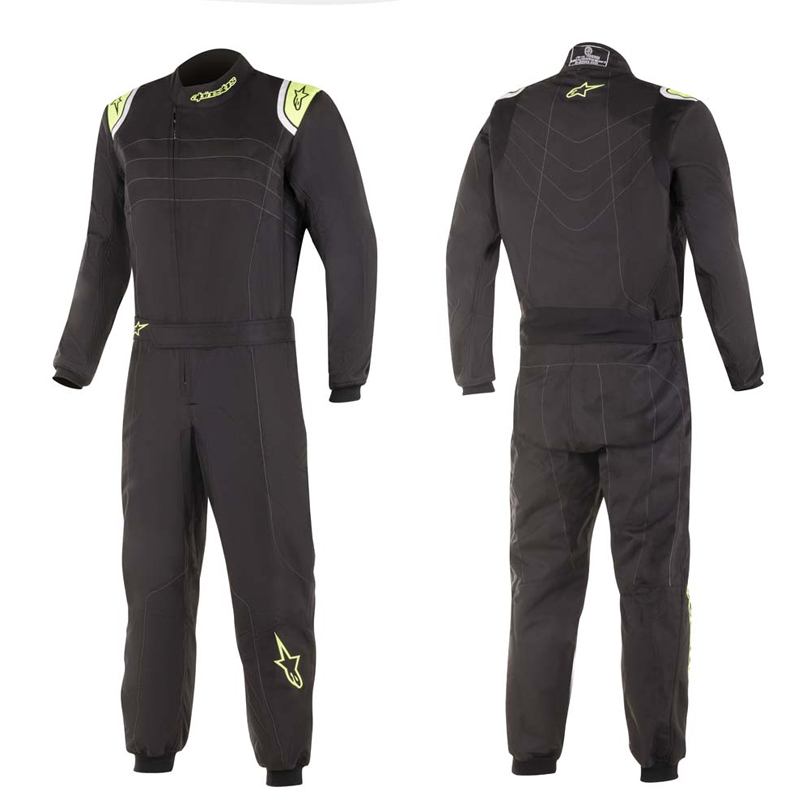 Lightweight and anatomically optimized, the Stratos features a shiny Nomex outer material finish to give the suit a vibrancy which aids the visibility of sponsor logos. Driver comfort is also paramount, and to this end the Stratos has knitted stretch panels on the arms and back, pre-curved arms and legs, and extended shoulders to offer a greater range of movement. Other details include an internal pocket, a fleece lining, cuffs on the arms , boot cut on the legs and flat seams on the shoulders. • Certified to SFI (SFI:3.2A/5) standard. • 100% Aramidic outer shell fabric has exceptional heat and flame-resistant proprieties. • Advanced three-layer Aramidic construction suit for improved heat resistance performance. • Alpinestars shoulder epaulette construction facilitates the effective extraction of a driver in event of a crash. Incorporating premium materials inside and out, the Tech 1 T is a light abrasion-resistant shoe offering superb comfort, performance and it built to withstand even the most difficult of driving conditions. Featuring toe and heel protection and strategically positioned perforation zones, the Tech 1-T incorporates a weight-saving, rubber-compound textured sole for outstanding grip, heel-to-toe feel and vibration resistance. • FIA /Alpinestars label on the tongue made from fireproof PU film transfer. • Main upper constructed from durable, full-grain cow leather for optimized levels of durability, comfort and abrasion resistance. 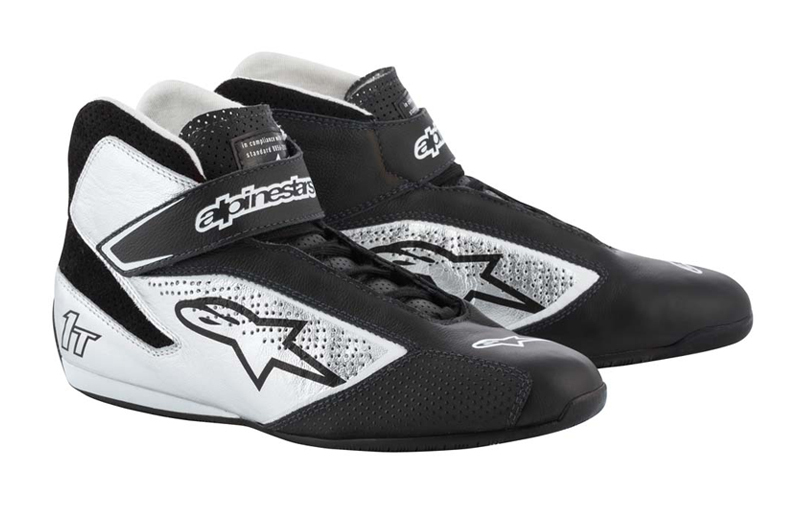 • Alpinestars' one-piece toe and heel counter features multi-compound construction and ergonomic polypropylene heel counter plus integrated insole, which provides support, protection and stability plus integrated PU fireproof heel for comfort. • Lightweight rubber compound sole with textured grip and improved pedal feel in race conditions. • Strategically positioned perforation zones for enhanced cooling performance and maximized airflow. • Certified to CIK-FIA Level2 homologation standard.N 2013-1. • Advanced two-layer construction assembly for optimized performance, improved breathability and weight saving. • Alpinestars asymmetric front opening design aids fitting. • Tech mesh panels positioned on the underarms and seat area for optimized ventilation. • Alpinestars Formula 1-derived design and technology shoulder epaulettes. • Ergonomic collar with soft knitted lining for extended coverage and maximum comfort with safe closure system. • Adjustable waist belt allows a tight personalized fit. • Knitted stretchable panels on back shoulder and lumbar area ensure minimal material resistance while driving. • Engineered for durability, minimal material bunching and abrasion resistance, while the poly-toweling lining boasts moisture-wicking properties. The Engine Glove is a hybrid multi-material glove which offer high levels of comfort and protection. 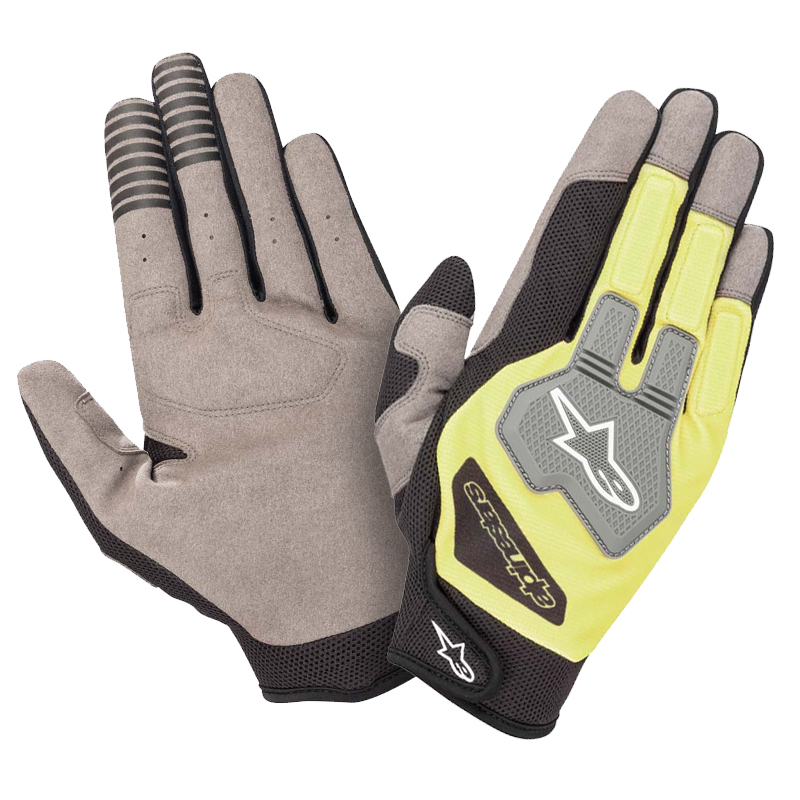 Soft, lightweight and flexible, the glove has mesh panels for optimum levels of breathability, while the tough synthetic suede leather palm means it is highly durable. It’s also reassuringly protective thanks to the strategically positioned TPR on the knuckles. Another neat feature is the conductive print on the palm and fingers which allows mechanics to operate a tablet while wearing the gloves. • Lightweight, multi-material glove incorporating a stretch mesh and stretch fabric on the top of the hand. • Stretch mesh and stretch fabric offer comfort and cooling performance. • Synthetic suede palm with padding provides grip, durability and tactility. • Hook and loop grip cuff closure on the back of the hand for a precise fit. • Strategic 2mm foam padding on fingers for fit and comfort. • Advanced TPR knuckle insert offers impact protection without compromising on hand dexterity.